USAG Bavaria’s Hohenfels Training Area is divided into two areas. The cantonment area makes up the installation’s offices, shops and housing areas. The 163km2 of wooded training area makes up the rest, known by locals as “The Box”. Teachers had the opportunity to learn about the mission they are here supporting as well as learn about the nature and long history of the area. There are so many unknown treasures among community members. Wittl took teachers to some of these unique locations. One attendee who has been working in Hohenfels for many years was excited to see the creek and lake in the northwestern part of “The Box” fed by clear natural springs. One touch of the long history Hohenfels has to offer is a tree planted in a former village as a commemoration of peace after the Thirty Year’s War in 1648. It had been hit by a bomb during World War II. The tree is still living even after the bomb was detonated and blew a hole in the side of the over 350 year old tree. One of the science teachers was happy to hear about the flora and fauna of the area, and was interested to see a field of more than 50 red deer grazing. A social studies teacher was excited to see the renovations being done on the palace of Lutzmannstein. One third grade teacher — who was so motivated by what she saw and learned — has since begun lining up her class standards in science and social studies so her students can also go into “The Box” and learn about the unique and diverse nature of Hohenfels’ hidden gems in Hohenfels. 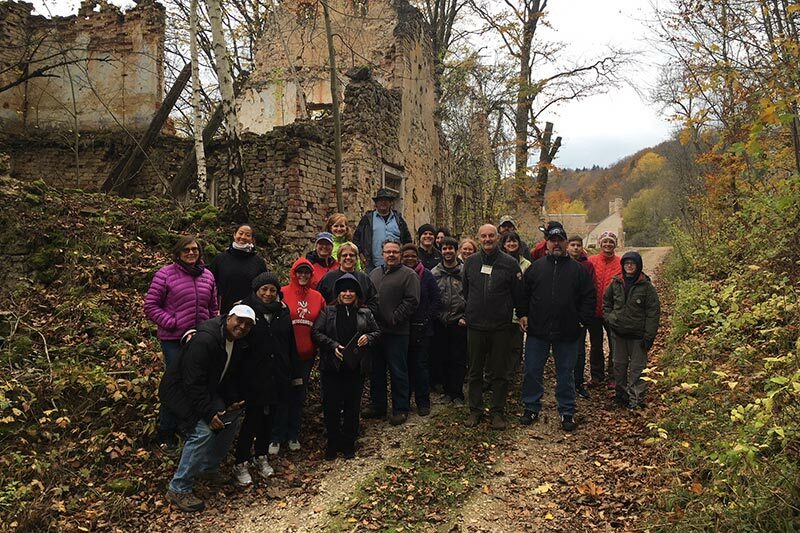 The Box Tour was organized through the School Liaison Office as the program recognizes the importance of teachers learning about the mission and unique history of Hohenfels. These garrison-led tours provide an insight into the local area and support a stronger understanding of the area in which we all live.